The KH 870 Dual 10" Active Studio Subwoofer from Neumann is a professional-grade subwoofer, ideal for tracking, mixing, and mastering applications in music, broadcast, and post production facilities. The sub has a 7.1 HD Bass Manager that is compatible with all standard consumer formats from mono all the way up to more recent 7.1 high-def systems. The subwoofer supports 8 channels of analog audio via XLR connectors for wide compatibility and flexibility in modern studios. You can also add an optional 24-bit/192kHz digital input card to add support for 8 digital channels. The sub has a sturdy cabinet with a pair of 10" front-firing woofers. 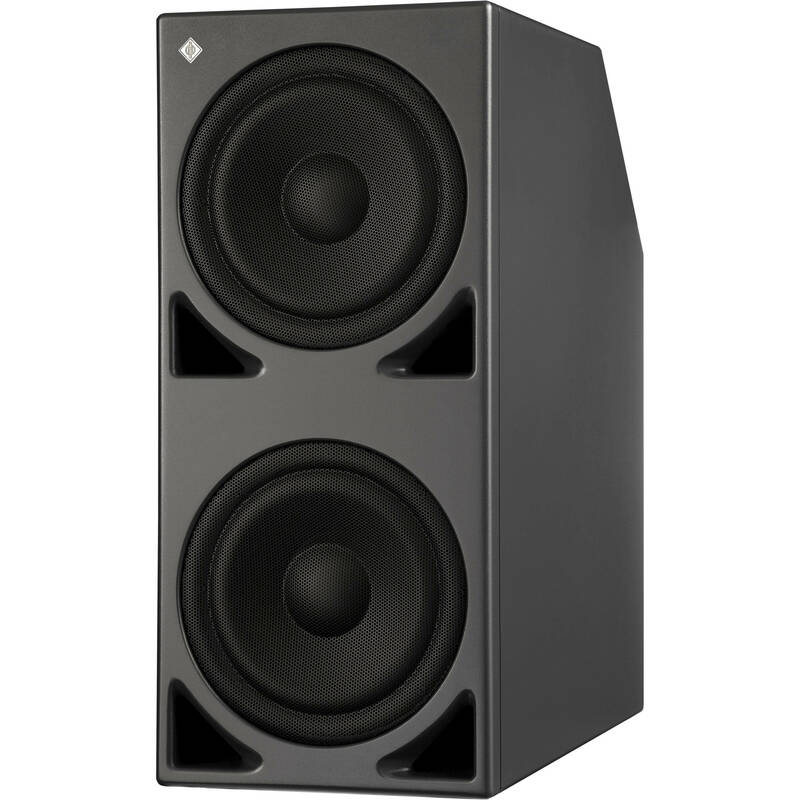 Front-panel bass ports extend low frequency response while reducing compression and turbulence. Because the ports are on the front, you can also position the sub next to a wall or flush mounted into a wall without reducing performance. The sub can be used on its own, daisy-chained with other subwoofers to make a larger system, or used with Neumann full-range monitors for a full multichannel system. The subwoofer has an integrated 8-channel system volume control and has an RS-232 port for use with an optional remote control. The electronics can be remotely turned on with 2 modes of operation. Using a remote allows centralized system control regardless of the source, and the electronics can be remotely located to reduce cabling. Other features include a bypassable 4th order 80Hz active crossover and 4-mode LFE processing, as well as an electronic limiter to protect the sub's amplifiers and drivers.